Editor’s note: The first installment of this two-part series about the problem of counterfeiting in the international wine trade (see “Protecting Your Wine” in the August 2014 issue of Wines & Vines) described the extent of wine fraud and introduced the types of anti-counterfeiting technologies potentially useful in the wine business. This second installment more closely examines track-and-trace tactics in search of the best anti-counterfeiting solution. This second installment of a two-part series about wine anti-counterfeiting looks more closely at track-and-trace solutions for wine packages. The author's research suggests that RFID and NFC technologies are the most promising means to supplement tamper-evident wine packages while also providing marketing advantages. The NFC solution makes the consumer the de-facto expert on the product and obliges producers to imagine and develop new bonds of trust with consumers. Under these circumstances, anti-counterfeiting technologies—particularly those intended to minimize the “Chinese risk”—have assumed a clear and incontrovertible strategic importance for producers of high-end wines and spirits. We can also see that, in the Chinese market, traceability methods are not always imposed on the importer, and the importers themselves are not always adequately monitored. Therefore, protecting the bottles upstream appears to be essential. “The real solution is to ensure that the bottles leaving Bordeaux are difficult to copy and easy to identify,” Jean Guillaume Prats, chairman of Chateau Cos d’Estournel, states in an article in Le Nouvel Economiste. On this point, radio frequency identi­fication (RFID) technology is likely to be a major development in security devices. More precisely, this refers to RFID without including near-field communication (NFC) technology, which in simple terms is a newer, more finely honed version of RFID. A 2012 study in MarketsandMarkets highlights this trend in terms of investment opportunities. RFID clearly appears to be the fastest growing technology among the high added-value markets, of which vintage wines are a central part. Among other trends in the food market, the study showed the importance of consistent budgets adapted to the implementation of authentication technology, and that RFID will become essential for traceability purposes and requires a greater awareness of current track-and-trace issues. Near Field Communication (NFC) is a short-range, high-frequency wireless communication technology that enables information to be exchanged securely between peripherals. The technology can only be used across very short distances and assumes a proactive approach on the part of the user. It also appears to be more efficient than the neighboring technology of QR (quick response) code. “For QR code, you need to activate an application, then take and upload a suitable photo, then wait until it is processed.…NFC does not have as many obstacles hampering its use: Tags can be scanned immediately merely by approaching them. You no longer have to launch an application first,” explains the spokesman for the French mobile wireless organization Association Franc?aise du Sans Contact Mobile. The level of security provided by NFC is particularly high since this technology has been used in the banking sector for more than 20 years. HIS Technology estimates that NFC will be available on two-thirds of telephones launched on the market by 2018. •	5,000 volunteers tested a means of payment using NFC for their London Underground tickets. •	Amsterdam Airport installed boarding gates that can be used with NFC technology by passengers carrying a smartphone. •	In China, a partnership between the world’s largest mobile network operator and the Chinese bankcard association planned to launch NFC payments in 14 Chinese cities. The market value of RFID and authentication is expected to increase from $500 million in 2013 to $3.5 billion in 2020, Secure ID News reports. Wine consumers generally have faith in brands and trade names at points of sale. If this confidence is not complete, they will try to verify the conformity or authenticity of the product they wish to purchase or consume. The first control level is the presence of an integral tamper-proofing device (unbroken, not reconstituted). This type of control does not require any particular knowledge: Packaging must be correctly closed and absent signs of having been opened. If in doubt, the consumer will not purchase or consume the bottle in question. In order to make his choice or carry out additional checks, the consumer will examine the information shown on the product (indicating provenance, labels, precautions, etc.). If the brand has implemented this functionality, the consumer can refer to a website using a Data Matrix or a QR code via his or her smartphone. If the consumer wishes to check the authenticity of the product (i.e., that the product has been placed on the market by the “proper” manufacturer), he must have access to secure means for carrying out this verification. Whatever these means are, the consumer needs to know what to check and how. This implies the provision of information about the brand to the consumer. As described in the first part of this series, numerous solutions exist for “marking” a product. This plurality makes it impossible for a consumer to memorize the markings and distinguish between them. Except in specific cases, the consumer will have to call on external assistance by means of a tool that is as standardized as possible. According to a 2014 article by the French chemists’ group Societe des Experts Chimistes de France, currently there is a strong trend to place the consumer at the center of the anti-counterfeiting device by enabling him to check the authenticity of the product he is purchasing using a smartphone. The process consists of associating a unique identifier with each bottle of wine and registering this identifier in an accessible database. This enables the consumer to check remotely in the database whether the identifier matches the bottle in question. The code is usually digital or alphanumeric, but a graphical representation on the object is also possible and can be compared with the one from the database. The fact that the consumer can easily verify the authenticity of the bottle offers a great advantage in terms of simplicity, and the smartphone offers greater flexibility of use compared to devices that require specific control equipment. There is a great variety of these dedicated verification systems, but it is impossible for the verification services (laboratories, customs, etc.) to have all the necessary equipment at their disposal. Another inconvenient aspect of these dedicated verification systems is that verification is carried out a posteriori in case of doubt and once a large proportion of counterfeit wines has already been distributed. The fact that the “signatures” (integrated in the glass, molecular with synthetically derived DNA, holographic, etc.) are very difficult to reproduce is therefore not a sufficient reason to protect a bottle from the risk of counterfeiting, since using specific control apparatus complicates and undermines the extent of the verifications. Counterfeiters are aware that the goods are unlikely to be checked and manage to make visual imitations of these signatures, which give the consumer a false sense of security since the likelihood that mass-produced items such as wine will be verified remains exceedingly low. This means that the smartphone solution cannot function unless security principles are taken into account, especially in the management of SMS (short-message service). Scanning a fraudulent code presents actual risk to the consumer of ending up on a pirated site, hence the importance of an SMS, which has a dynamic security protocol permitting strong authentication and reducing the risk of fraud. However, SMS has the advantage of providing a direct and specific computer connection, which minimizes such a risk. • They can be easy to integrate. • They are unknown to the uninitiated. • They can easily be reinforced. •	They may entitle the holder to manage the entire process. It is necessary to take into account the extent of the counterfeiting problem for the alcohol in question, its pricing, the company’s budget and strategy as well as the proprietary solutions that the producer may own. • OVD technologies, in particular holograms, although they are reasonably priced and relatively easy to integrate, appear to be slowing in the wine sector even for mass-market solutions, since counterfeiters have become highly skilled at counterfeiting such protective devices. • Nanotechnologies are a medium-price solution but are scarcely reliable for surveillance of the gray market. Such surveillance can only be ensured by means of a unitary marker (i.e., different for each product unit, but taggants only allow marking of the batch). • DNA protection, as we have seen, requires dedicated laboratory-type equipment for carrying out this kind of check, and it is certainly reliable but implies a rigorous and lengthy control protocol. On the other hand, the low probability of inspections may encourage the development of counterfeits. • The technology of chaos and bubble code retains a certain credibility in the sector, but predominantly for mid-range alcohol. It remains suitable for protection of the gray market. Its cost is between the OVD and RFID-NFC technologies and would therefore appear to be a relative asset. Its ease of integration is, on average, also equivalent to that of RFID-NFC technology. Its main weak point is its relative protection for refilling, which is a major risk. • NFC technology appears to be the most secure solution and the one most suitable for uses that do not focus entirely on anti-counterfeiting measures. It is particularly appropriate for high-priced wines, since there is a real cost of investing in such a solution. NFC has been more reliable and potent than the neighboring QR code technology. However, this latter technology can still be an anti-counterfeiting option for mid-range wines or standard spirits. In calculating ROI it is necessary to understand the starting point. Outside the field of counterfeiting, the figures are merely estimates. The strongest risk of commercial and financial impact comes from the consequences in terms of image if such illicit trade is revealed, particularly for high-end wines. The significant case in China involving trafficking of bottles of Cha?teau Lafite resulted in a decline in the selling price. • An authentication or anti-counterfeiting solution to confirm that the bottle is authentic. • A track-and-trace solution that enables the bottles to be traced. • Marketing that enables the consumer to access the interactive content by scanning the code on the bottle’s packaging. Chateaux Margaux, for example, uses three security systems (laser etching, bubble tag and secure paint). According to Olivier Chotard, the winery’s head of information systems, these three solutions make it possible for the wine estate to cross-check information and optimize security if one of the protection methods should fail—and it also acts as a deterrent. A strategic point raised by Chateau Latour is the importance of protecting the bottle at capsule level (instead of behind the label, for example). Any technology associated with the capsule also offers protection against refilling. It is imperative that the technology in question cannot be imitated and that it is not possible to remove it without spoiling the bottle. Protecting the device once it is in place is therefore essential. • Has a seal attached. As indicated above by anti-counterfeiting consultant Jean-Michel Loubry, many attempts at complex “mechanical” seals have been counterfeited, and in the future the best capsule protection will involve a digital security system. According to the consultant Dominique Paret, a solution that incorporates an RFID technology adapted to the constraints of the bottle design, for example, might turn out to be suitable. Paret added that the tag would ideally be rendered useless once the capsule is removed. become the best defense against counterfeiting. • In developed countries it may allow useful marketing feedback to be obtained. Furthermore, consumers increasingly want interactive relationships with and proximity to their favorite brands—particularly using their smartphones. • In countries such as China, direct contact with the consumer also enables the latter to be reassured about the authenticity of the product. This phenomenon is also evident in countries such as Russia, where only 7% of Russians are satisfied with the protection provided by the Russian state against the circulation of illegal alcohol, according to a 2012 report by Philippe Collier, publisher of Contrefaçon Riposte. On the other hand, in China many of the players in the sector (importers, distributors, restaurants, etc.) are new and not always able to protect the supply chain as required, and therefore contact with the consumer is an option that is both robust and effective. On a more global level, using an anti-counterfeiting technology also enables a company to position itself as an innovative leader, sending a message to players in the market. According to a recent note by the McKinsey firm, the world of tomorrow will be connected and volatile in the long term. The consequences of such an evolution will be that the counterfeiting environment will become increasingly fragmented and complex, and businesses will have more and more difficulties in overcoming—alone—the surrounding risks of counterfeiting. Forward-looking business practices may see commerce and e-commerce come together. In 2020, the mobile phone will be more central to e-commerce than it is today, but having a “physical” network could well still be essential. The integration of digital technologies with more “physical” ones will be a strategic factor in current anti-counterfeiting technologies—and especially in future applications. The spirits sector—and especially the fine wines sector—must therefore take this trend into account even more and become involved in this evolution, which is not just about anti-counterfeiting measures, but relates more generally to protecting their production. As is often the case for this type of innovation, the cost will come down as the procedure becomes more widely marketed. The final prediction is that anti-counterfeiting technologies will become increasingly strategic for businesses, given that ABC12.com in Flint, Mich., states the market in food and pharmaceuticals is expected to increase from $57.4 billion to $142.7 billion in 2020. China is expected to remain a strategic area for this problem, since alcohol sales are predicted to increase in value by more than 10% per year until 2017, according to the China Food & Drink Report. At the end of this study, we are surprised by the lack of analysis regarding the scale of the problem. Unlike the majority of business sectors, even the customs statistics targeted at the wine sector are not accessible. It would therefore be useful to encourage international institutions (WCO, European Union, American, French and Chinese customs authorities, etc.) to publish more detailed statistics concerning wines and spirits in order to allow the comparison of seizure trends over time and by location. More detailed analysis of counterfeiting—especially in Europe, the United States and above all in China—also are expected to be initiated on certain subjects such as the Internet and counterfeiting techniques and trends. Wine producers have responded empirically in such circumstances. For a number of years the anti-counterfeiting campaign may have been perceived with alarm, because it was felt that drawing attention to the issue would worry consumers and the players in the wine supply chain. Yet the increase in the problem, particularly in China, has forced producers to respond. The initiatives nevertheless seem to be dispersed and fragmented and would benefit from identifying a greater number of synergies. Moreover, certain players seem to be more cutting-edge, such as the Bordeaux Grand Crus or certain spirits. When it comes to combating the counterfeiting problem, security technologies appear to be the best option in such a volatile environment, where commercial flows have become more numerous and difficult to control, particularly on Chinese territory. 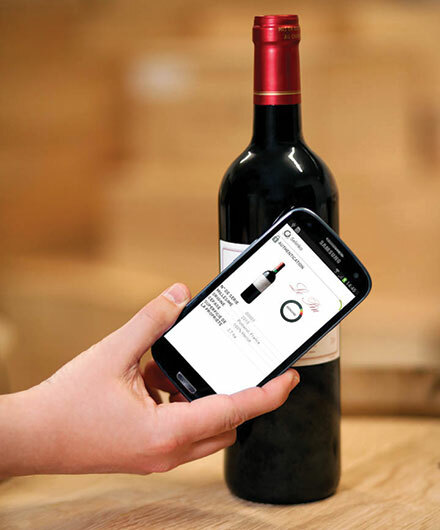 If, as we have shown, a choice of technology is always associated with specific problems, at the end of our analysis it would appear that the NFC solution ought to take off rapidly in the wine sector—particularly in the high-end segment. This technology is effectively part of a logical evolution in digitization in the industrial environment and also on a smaller scale. NFC solutions put the consumer at the heart of the device as the de facto expert on the product and oblige producers to imagine and develop new bonds of trust with consumers. Finally, at the more organizational level, the choice of such a technology, which has wider logistical and marketing issues, also requires the fulfillment of a certain number of conditions (importance of service and of advising the supplier, compliance with standards, digital culture of the wines or spirits producer, etc.) in order to maximize the broad potential of this new environment, which should mobilize everyone involved in the business. Eric Przyswa, consultant and associate researcher at Mines ParisTech at the Centre for Research on Risks and Crises, conducts research in the area of human security in industrial environments. He also acts as a consultant in this field to institutions and businesses. His works has appeared in academic journals in France and abroad.